Northern Rivers Region, New South Wales, Australia. ‘Terania‘ is thought to be a local Aboriginal (Bundjalung) name meaning ‘place of frogs’. <<Nightcap National Park, part of the Gondwana Rainforests of Australia World Heritage Area, is a dramatically beautiful park full of ancient rainforests, magical waterways and spectacular views. 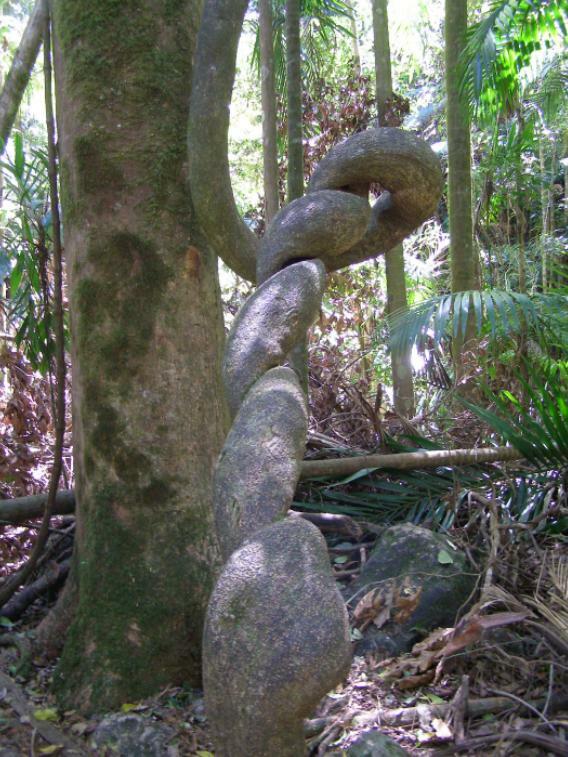 The lush rainforest provides a home for the newly discovered nightcap oak as well as a number of threatened animal species, including Albert’s lyrebird and Fleay’s barred frog which takes shelter under leaf litter and makes an ‘ok-okok-ok-ok’ after rain. 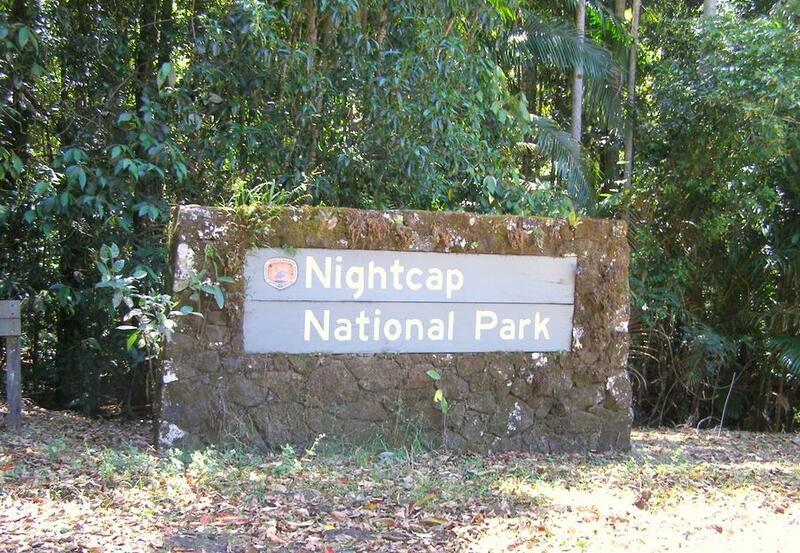 However, were it not for a handful of dedicated environmental activists protesting on site in the late 1970s, the Nightcap National Park would not exist. 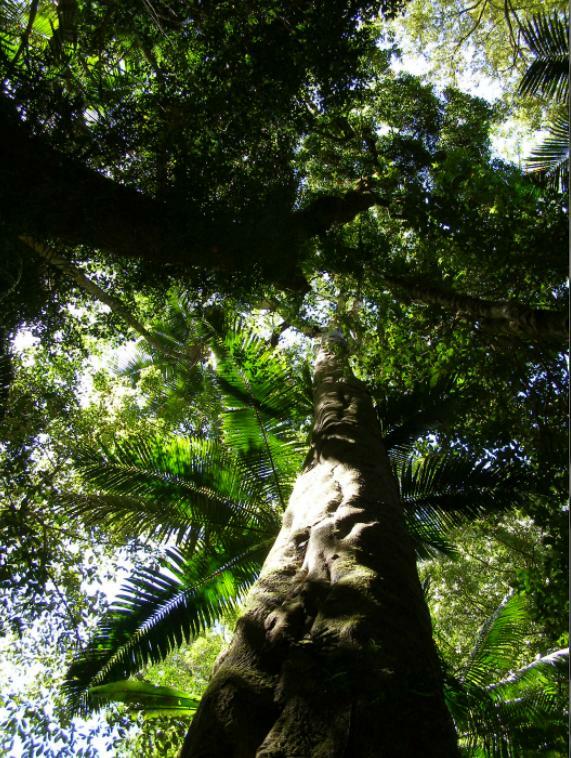 Its magnificent rainforest ecology would be have been decimated by industrial logging, then scorched-earthed and the entire landscape converted to pasture, resembling much of what has occurred throughout the Northern Rivers Region. 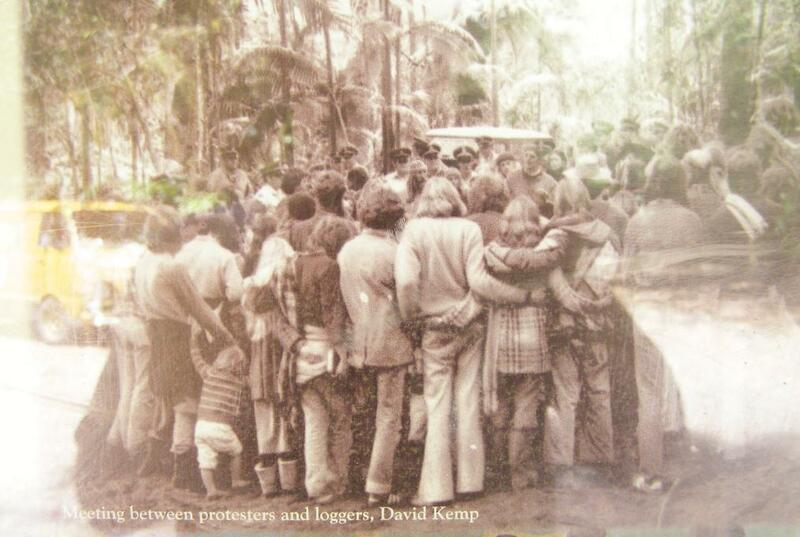 In the late 1970s, the government sent in the police to protect the loggers, not the rainforest. So when one visits the National Parks offices staffed by government employees, reflect on the fact that the offices and staff exist not because of government leadership, but because of the selfless will of environmental activists prepared to go to jail to save these invaluable and increasingly rare rainforests. This black and white photo by David Kemp (1979) is part of a faded pictorial history montage behind glass in a National Parks visitor noticeboard located at Protesters Falls car park, alongside Terania Creek. The image of the original photo has fault in that it includes reflection from the glass showing a yellow van at the car park, not in 1979 but in 2013. We happily walked along the board walk to Protesters Falls, passing by we assume the van’s owner happily bent backwards meditating on a large beach ball within the shaded tranquillity of the very tall rainforest. Unawares, he has inspired the writing of this article. 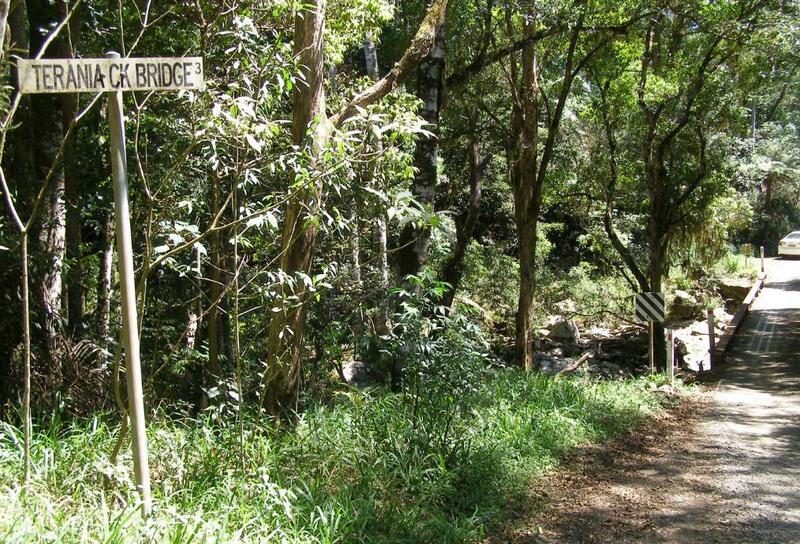 << The conflict began in 1979 over a small patch of rainforest in Terania Creek, in north-eastern New South Wales. 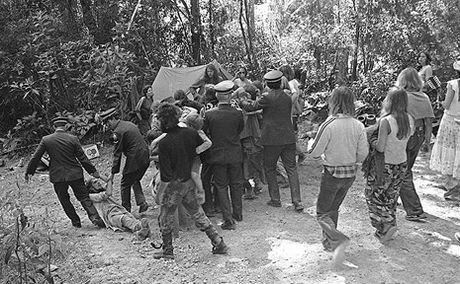 It was Australia’s first forest protest, and it was ahead of its time both globally and environmentally. 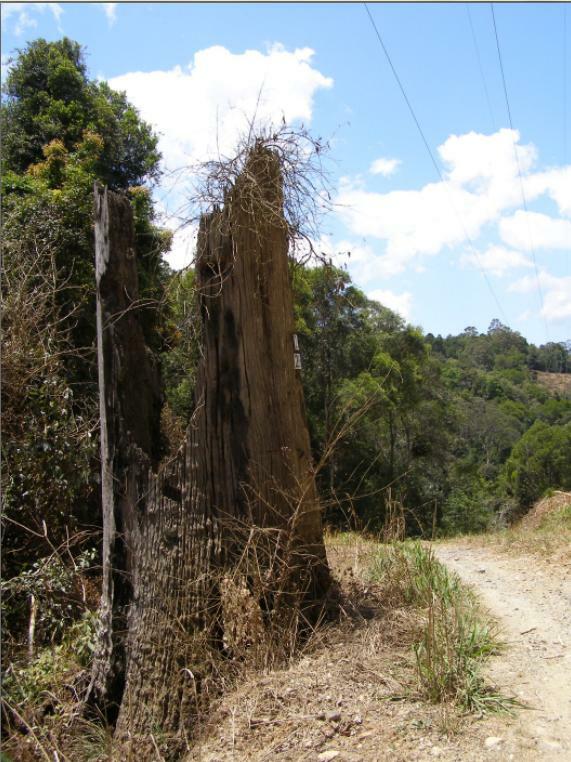 The conflict spread across New South Wales and pushed forestry issues to the forefront of politics. 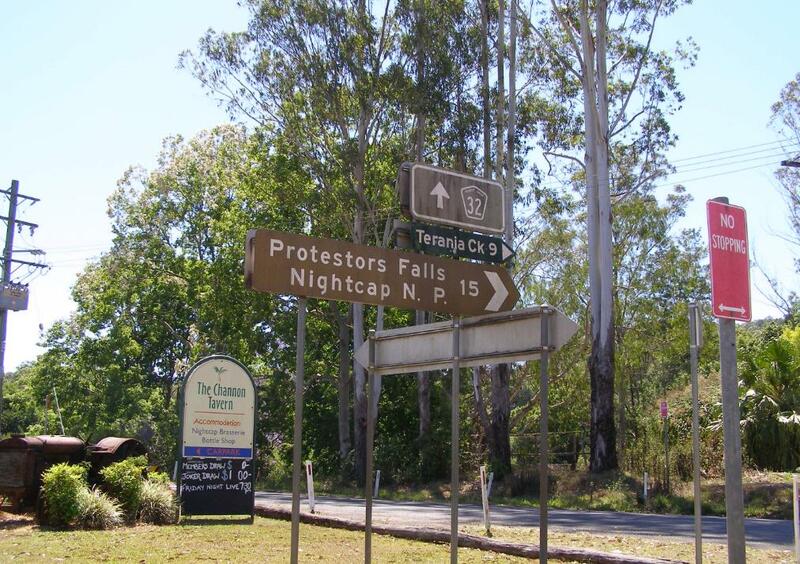 Protesters from Terania Creek went on to similar conflicts in the Franklin River in Tasmania, the Daintree rainforests in Queensland, and Errinundra Plateau in Victoria. 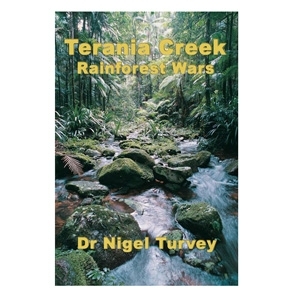 [Quoted extract from the preface in the non-fiction book, ‘Terania Creek: Rainforest Wars‘, (2006) by author Dr Nigel Turvey, published by Glass House Books, Brisbane. A part of what has now become Australian history that needed to be told, a reflective generation later]. [© Photo by Darcy McFadden, The Northern Star (newspaper) photographer]. “There was a big rally and the protest organisers asked if they could use my PA. They called for people to blockade and a lot of people went straight from the market to the Nicholson property which bordered the rainforest. We camped there for more than a month. Everyone was up at the bulldozer, blocking its way into the rainforest – there were cops everywhere. 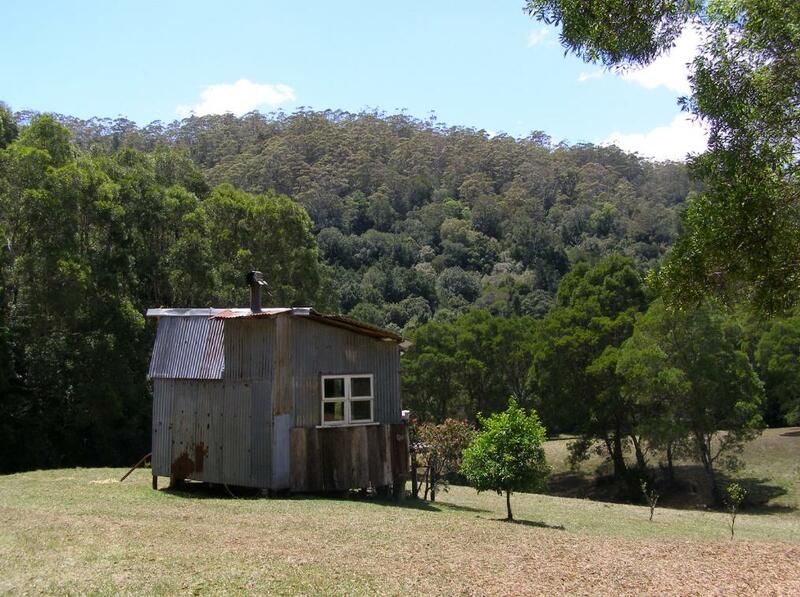 << “Urban refugees Hugh and Nan Nicholson moved onto a property at Terania Creek in northern NSW 30 years ago. They were hoping to escape the rat race and live a self-sufficient lifestyle, but discovered that the forest surrounding their property was earmarked for extensive logging. 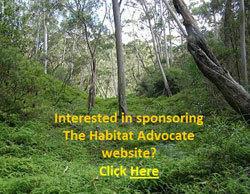 So began one of Australia’s most fiercely fought environmental battles, the 1979-1982 Rainforest Wars. The wars ended with the formation of Nightcap National Park, which was World Heritage-listed for good measure in 1989. One of the unexpected bonuses of this book is that it offers an inside look at the forestry profession and how it fell from grace (in the public’s eyes) during this campaign, never to recover again. The National Parks Sign with appropriate graffiti-etched message. A poignant reminder that Nightcap National Park came about only because of Community Direct Action. << On the easternmost part of Australia, it survived the drifting continent’s climatic shifts and a hundred and fifty years of timber-getting. In 1979 some claimed it was the last unlogged rainforest and should be saved, but for foresters and saw-millers it was the last rainforest they would plan to log. 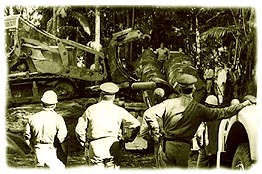 The dispute over logging flared into the Rainforest War across New South Wales. 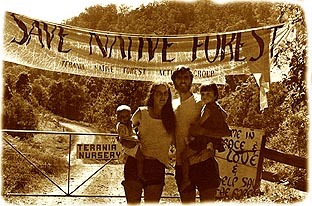 Today forest protests are part of Australia’s political landscape, but Terania Creek was the first. This story is about the people from both sides who fought over the rainforest, but the enduring player in the story is the rainforest itself. 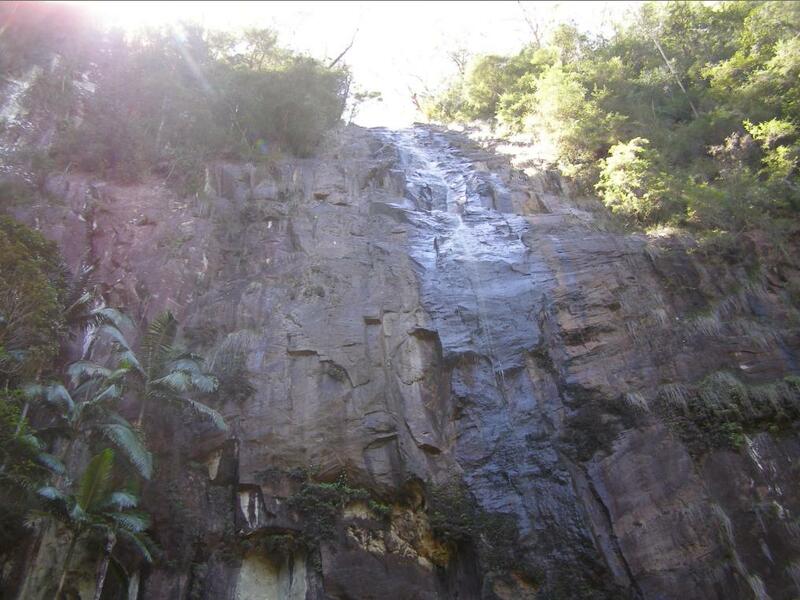 << In the early part of the twentieth century, the rainforests and drier eucalypt forests of the caldera (volcanic basin) were logged by sawmills that grew up around the ranges, providing timber for new rural industries and housing for the expanding population of the young State of New South Wales. 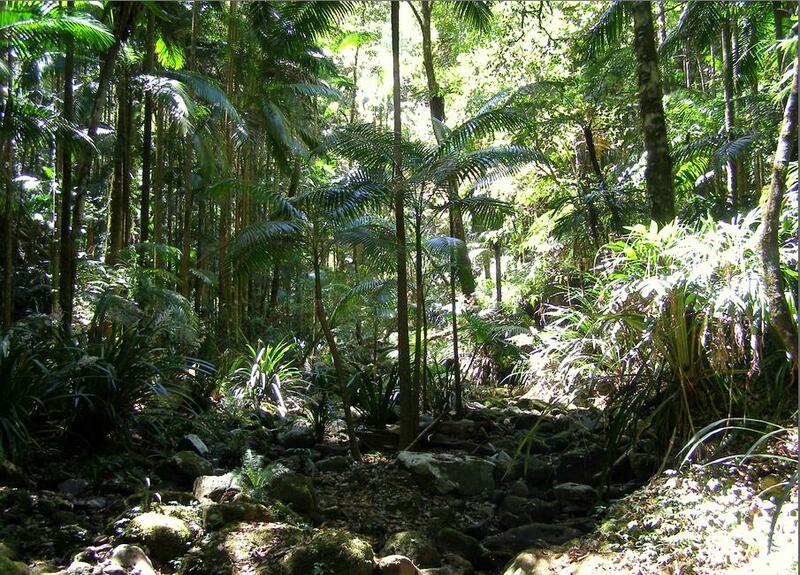 << More than two hundred years of European activity along the eastern seaboard reduced Australia’s rainforests by three quarters of their pre-1770 cover, through clearing for agriculture, uncontrolled logging, and conversion to plantations (and dairy pasture). The rainforests, which covered just 1% of Australia two hundred years ago, now cover just one quarter of one percent of the Australian landmass. << In September 1973 Hugh and Nan Nicholson, two urban refugees looking for a self-sufficient lifestyle, found Terania Creek. They drove north from the hamlet of The Channon on a rough dirt road through steepening hills that forced the road to wind tightly around and through the creek on the valley floor. The road following up and crossing over Terania Creek multiple times. 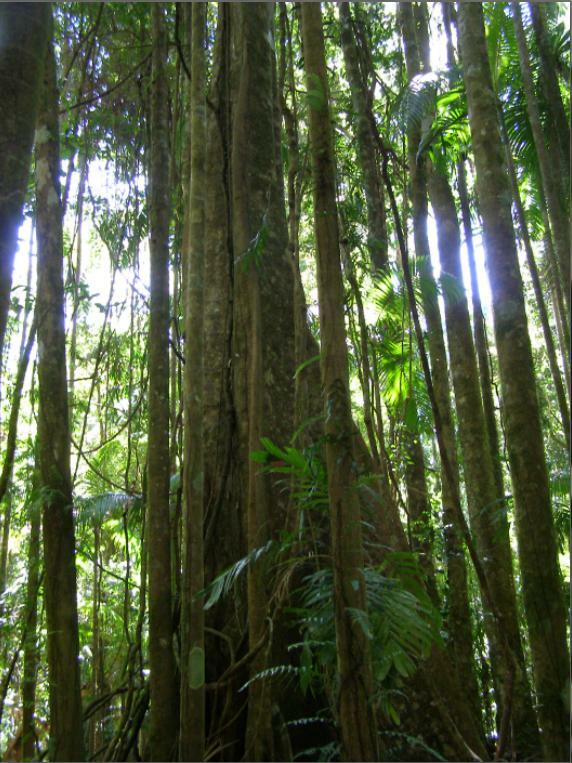 <<Then a war broke out in this most peaceful landscape – the Rainforest War. 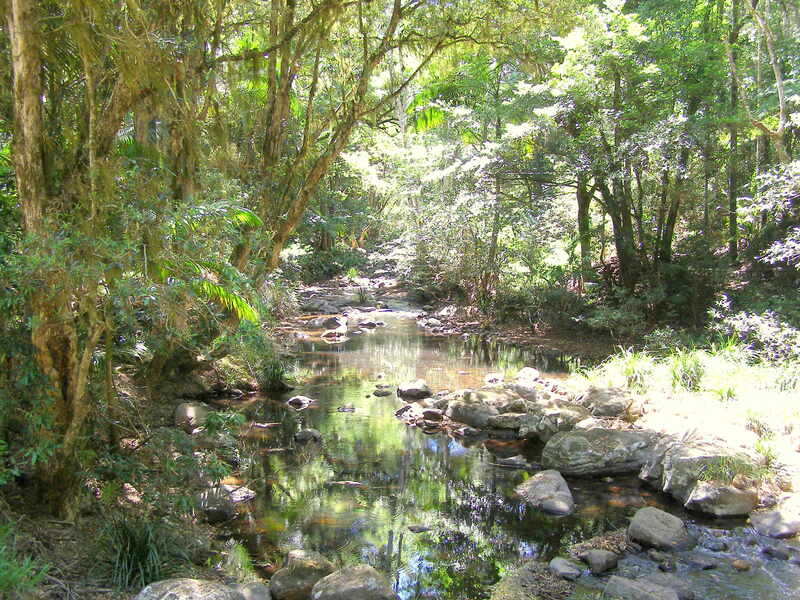 It started in 1979 with a battle over the rainforests of Terania Creek and spread to rainforests across the State of New South Wales. On one side were the young settlers making their homes around the caldera. On the other side were the Forestry Commission of New South Wales and the sawmills it licensed. The joys of trouble-making on a grand scale! << Helicopters landed in the paddocks, police cars parked all over our precious grass, the campers kept expanding their area. All along Hugh and I had feared defeat and the loss of that exquisite forest. Now we feared loss of control of our lives. And we weren’t even getting into the forest to do the heroic stuff with all the other activists. We were pinned to the cabin with the phone stuck on an ear, sitting in strategy meetings while trying to remember where the kids were, or hunting for vital but constantly disappearing papers. But we loved it too. The joys of trouble-making on a grand scale! The media whirlwind! The politicians suddenly ringing us! The euphoria of watching so many different skills miraculously dovetailing for an inspired purpose! The discovery of so many fascinating and resourceful people! And on top of all that, after four weeks of intensity, we won. It was hard to believe. Was it the daily road blocks or the protestors up trees that did it? Was it the cut-up logs? That was bad press and everyone was appalled but it stopped the trees being felled wholesale. Was it brilliant, or just lucky, media manipulation? Was it the penetrating and relentless phone calls by Bren Claridge to Premier Wran’s office? Was it the lack of trespass laws which would have kept us out of the forest? Was it simply a state government leaving all the pawns to fight it out and point to the safe jumping side? Was the time just right to save rainforest or did we help to make the time happen? Community cohesion thrives on tackling big issues together. And there are huge challenges confronting us: the local impact of climate change; the Dunoon Dam; the inevitable attack on forests thought saved for ever; an increasing regional population that also expects more per person in resources; the breath-taking irrationality of the belief that growth without limits is even possible let alone desirable. People still come up to us in the street and say “I was at Terania Creek and it changed the direction of my life!” It sounds so corny now but it did feel like a coming-of-age for all of us, the new-age interlopers, even if it wasn’t appreciated by the “real” locals. Our ideal of self-sufficient living had turned out to be insufficient until it had acknowledged and defended the landscape in which it was embedded. Finally, if nothing else, the wrestle for Terania Creek finally put us in touch with the original custodians, the people who fought for the land first and were massacred for it, in one of the worst killing fields in the entire country. We realised that fighting for your own backyard is a long-standing and deeply honourable activity. If everyone genuinely safeguarded their own patch most environmental problems would evaporate. And so would many social problems, since it is connectedness with its people and its history which enables little communities like ours to love themselves. 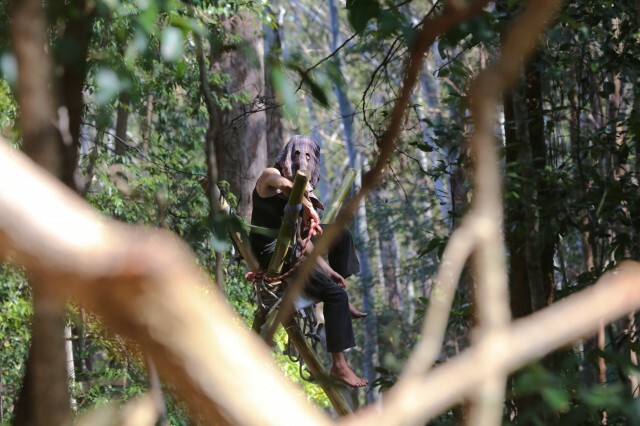 << “The protest against the logging in Terania Creek Basin has been an occurrence of great social significance and for those present a spiritual experience unprecedented in their lifetime. How was this accomplished? Through the implementation of practices which re-enforced our belief in the good will of the people, the sacrifice of personal ego to guidance by the group mind. Without the circle meetings, wherein all information and feelings were exchanged and decisions made, none of this would have been possible. “May the circle be unbroken” became our deepest hymn. Through the centring of the group in the linking of the circle, the group mind was evoked and, miraculously at times, consensus was achieved. We all undertook to respect that consensus, which gave us a bewildering and potent presence in the heat of confrontation with a structured, hierarchical, but rigid and confused opponent. And in this way we won each day and the argument to boot, demonstrating to even our amazement the power of clarity, love and peacefulness over ignorance, insensitivity and brute force.